How are you celebrating the new Mad Men season? Dressing up and going to a viewing party? Dressing down and watching from home? 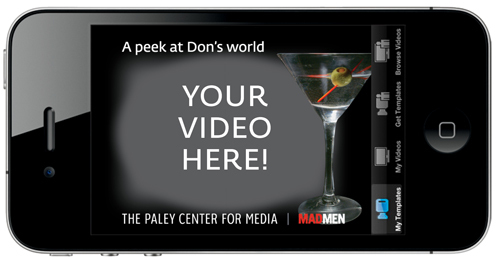 Pick up your iPhone RIGHT NOW to make a Mad Men video postcard, and mabye we'll highlight yours on PaleyCenter.org! You'll love the results and so will everyone you share your videos with. Enjoy a swanky cocktail party before the season premiere screening. Come dressed in your best retro-styled finery and receive a Season 5 Mad Men poster, courtesy of AMC. Mad Men Trivia Contest, with tantalizing questions from Basket of Kisses Roberta & Deborah Lipp. Screening of the Mad Men fifth season premiere LIVE from 9:00 to 11:00 pm. Oh how we have missed Mad Men…the style, the cigarettes and alcohol, and, above all else, the mesmerizing personal and professional machinations of conflicted ad man Don Draper. The Paley Center is delighted to host a live presentation of Mad Men’s fifth season premiere on the big screen—all the better to soak up that gorgeous period detail. Adding to the ambience will be era-appropriate cocktails and a selection of “retro-mercials” (actual ads from the early sixties) screened during the program’s breaks—look for familiar Sterling Cooper clients including London Fog and Lucky Strike. Best of all, you are encouraged to attend in your finest vintage or retro-styled finery! Let’s turn back the clock to more stylish times and break out the sharp suits, pocket squares, and kicky frocks to make the Paley Center New York’s most fashionable location on this special occasion. Starting March 15: Follow us on Twitter @paleycenter.org for a question-a-day from the Lipp sisters Basket of Kisses blog.